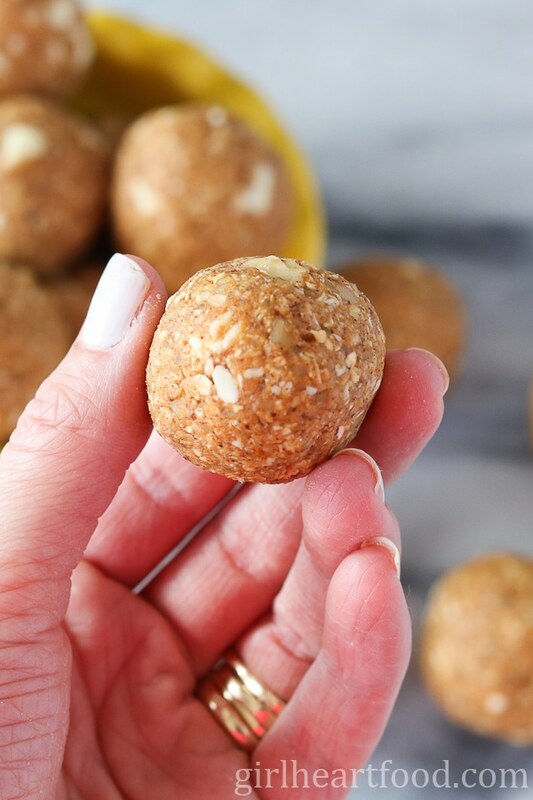 These No Bake Pumpkin Pie Bites are made with a few basic ingredients and are a fabulous way to use up that huge can of pumpkin puree you have hanging around in your fridge. Plus, they are a tad healthier than having a big hunk of pumpkin pie (which I love, by the way). Fair warning – you just may want to eat more than one! Hey everyone! Happy Thanksgiving to my fellow Canadians! What are you up to? I hope you are face first into a big ol’ plate of turkey dinner with all the delicious sides. Speaking of sides, what’s your fave? I think mine has got to be dressing, otherwise known as stuffing. I don’t know what it is about that stuff, but I can eat a huge plate of just that….oh, and with gravy. Don’t confuse pumpkin puree with canned pumpkin or pumpkin pie filling. Sounds silly, right? I mean, they both come in a can! Basically, pumpkin puree is the real deal. Like, real pumpkin that’s pureed. No added stuff. Canned pumpkin, on the other hand, is sweetened and usually has a bunch of spices added to the mix, like cinnamon, nutmeg and clove. 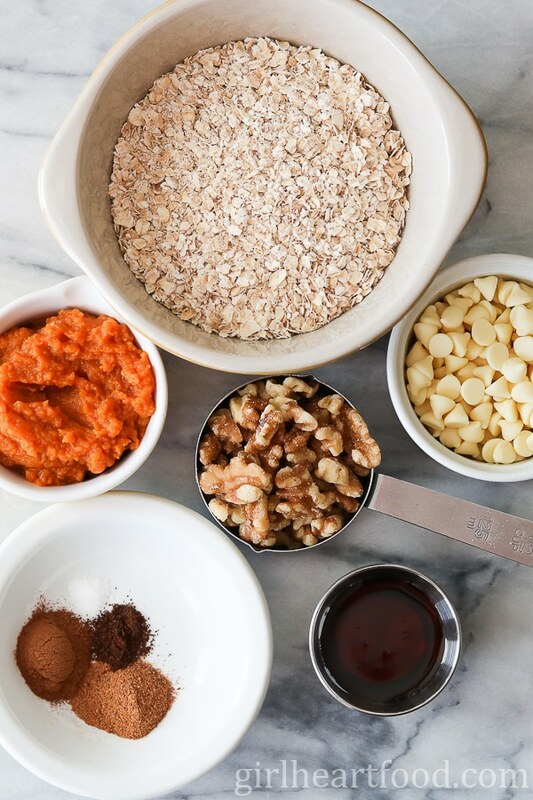 For these no bake pumpkin pie bites, I’m using pumpkin puree. The only size can of pure pumpkin puree that I’ve found around here is a whopping 3 cup can. What the what? Who needs that much pumpkin in a recipe. Don’t get me wrong, the stuff is great, it’s just a lot. Sometimes I find it hard to avoid food wastage with just hubby and I so I’m always trying to look for ways to re purpose stuff into another meal. I love little nibbles like these Pumpkin Pie Bites and they couldn’t be easier to whip up. In less than 10 minutes, you could be shoving one of these into your pie hole. 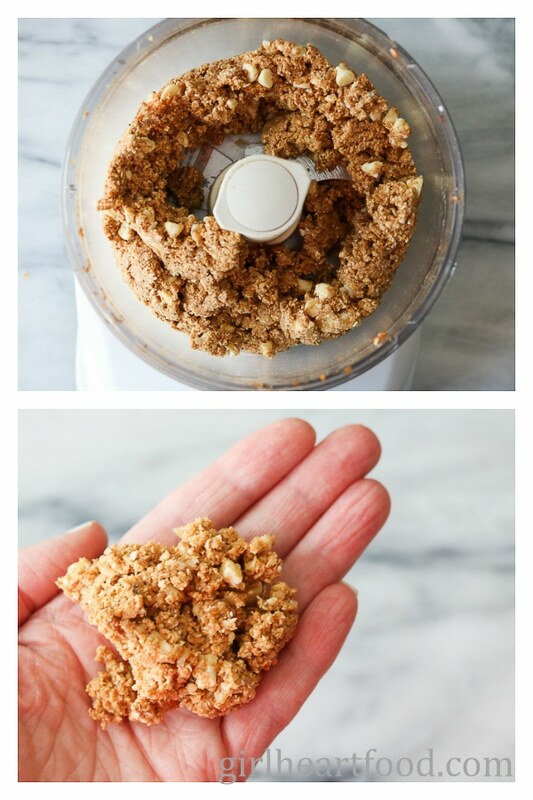 You just mix the ingredients up in a food processor, form into balls and way to go! They are perfectly delish to eat right away, but even better when chilled for 30 minutes or so. I added white chocolate chips to the mix here to emulate a ‘whipped cream’ if you will and they add the perfect little touch of sweetness. Milk or dark chocolate would work lovely too. It’s corny, but we should all be thankful every single day – thankful for life, thankful for friends, thankful for family. It’s all too easy to take things for granted. We’ve all been there, complaining about stupid stuff in our daily lives. But, as the saying goes ‘don’t sweat the small stuff.’ Take a minute today and be in the moment. Look around. Smile. Do something nice for someone else. Be thankful. I want to take this moment to thank you, my subscribers, my readers. I appreciate every single one of you. It makes me so happy to cook, share recipes and stories with you guys and chit chat with you. Thank you. It means the world to me. These look SO delicious! Love pumpkin and I love that these are no-bake! My kiddos are going to go crazy over these. I’m a little afraid that if I make them they will disappear before I get a chance to try one myself! Haha – been there 😉 Thanks Chelsey! What a lovely article. Just came across it now though, I realize it was written for Thanksgiving. There truly is so much to be thankful for and its important to remember this when things get difficult. I have so much pumpkin leftover from roasting one on the weekend. Going to give these a go! I hate waste and these bites sound perfect! Thank you Shauna! These are good any time of year if you as me 😉 Enjoy! I made these today and it seriously took me just 10 minutes! They taste just like pumpkin pie and they even had a similar texture! So good! Yay! So happy you made ’em!! Thank you so much, Leanne 🙂 !! I hear ya on the pumpkin puree. I opened a can on the weekend and I’m still trying to get through it! This recipe for pumpkin pie bites will definitely help me use up the rest! Love pumpkin desserts and wowsy – 10 minutes. You are a miracle worker my friend! Delish and under 10. I am in. I can already envision my sisters and mom sitting around in the am for T-day and sipping coffee eating these lovely bites. Thanks for sharing. Happy belated Thanksgiving, Dawn! I’m totally chuckling at the idea of you and your huge can of pumpkin. But I think you put it to great use! 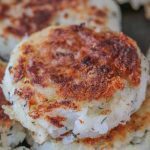 I’m all about bite-sized snacks, and the flavors in here are perfect for this time of the year! Yum!! Hi Dawn! Hope you had a wonderful thanksgiving! I’m afraid I spent mine sleeping lol (long story). These look great. And yes, a great use for extra pumpkin puree. That can is massive! I think I made 3-4 recipes out of it haha. No complaints, it was a delicious endeavour 🙂 Hope you’re having a lovely week! Same to you Jolina 🙂 Love to hear that story!! Have a great weekend! I hope you had a wonderful Thanksgiving Dawn!!! Like you, I am grateful for this blogging community and all of the fun and adventure that comes along with food blogging! I’m sooo happy that I have all of the ingredients I need to whip up a batch up these!! The white chocolate chips are a brilliant addition. Great stuff girl!! I’ve got plenty of 14oz cans of pumpkin, but I can STILL never seem to use a whole can up before it goes bad! This is such a great idea! Hope you had a wonderful Thanksgiving up there Dawn! If I lived in such a gorgeous part of the world and I’d be grateful 24/7:) These are so cute! And I love it that there isn’t too much pumpkin in them -festive but not aaaallllll about pumpkin. I vote for white choc chips, glad we see eye to eye on this one, lol. Have a great week! Thank you Milena! We did 🙂 Have a great week too! Oh my, these are the most perfect little fall bites Dawn! I love easy, tasty treats like these. The best little late morning or afternoon snack to help keep me satisfied! Pinned! Thank you Mary Ann! Me too 😉 Appreciate the kind words and Pin! Happy Thanksgiving, Dawn! I’m thankful for friends, family, and my nephew Moe staying with us again this weekend :). LOVING these pumpkin pie bites! Portion control is not one of my strengths so I’m all about food with built-in portions. I hope you have a fabulous and food-filled day! Hooray for all things pumpkin! 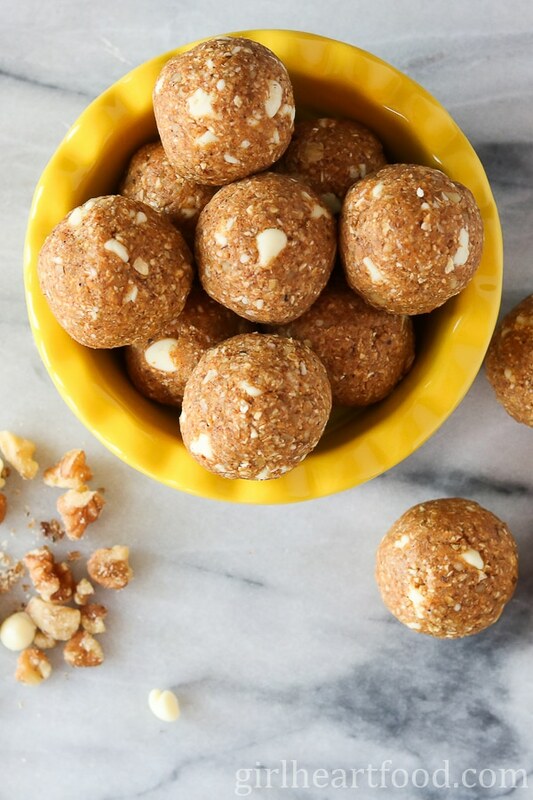 Energy bites are one of my favorite treats to whip up, and this pumpkin pie version looks delish. Love all of the fun flavors in here, especially the white chocolate chips. These would be perfect for breakfast, dessert, or anywhere in between! 🙂 Pinned! Happy Thanksgiving to you! High five to that!! I totally agree 😉 Thanks so much, Gayle!